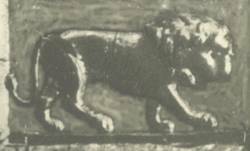 Below right, is a wax image of a lion walking or striding with some purpose. (Some might interpret that the lion is bowing). The lion’s head seems to be looking down rather than ahead, perhaps with a reflective or contemplative countenance. Its mouth appears to be open. The tail of the lion, though hanging down, is curled up. The seal that produced the wax image had been brought to the colony by David Brown in 1801, and is believed to have belonged to his grandfather. It is claimed that the ‘Chevalier’ or ‘Old Pretender’, gave this seal to his close friends. It is purported to be a Jacobite seal. 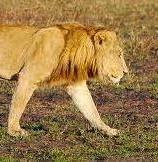 The image has been usually referred to, or described as a ‘Lion Morne’, which is meant to represent a lion without tongue, teeth, or claws (and possibly without a tail). Family legend suggests that the image on the seal is meant to be a lion with a forlorn countenance, and that it is intended to represent the Royal Lion of Scotland mourning for the loss of his crown. No evidence has come to light yet to support this claim. One of David’s granddaughters, most likely Mary (1823–1910), but possibly Catherine (1826–1905), is said to have remembered that when she was a little girl, her grandfather showed her a chest of dresses, fans and slippers and a seal. 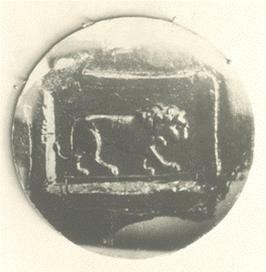 Supposedly this seal that created the ‘Lion Morne’ image. A photograph was taken of the impression on a wax seal on a deed signed by David in 1826. The Brown family gave a photo of the wax seal to Miriam Chisholm. In consequence, it now resides in the National Library of Australia as part of her collection The deed concerned a transfer of ownership of land - It is most probable that the deed concerned his grant on the Hunter River at Jerry’s Plains which he transferred to his son David (II) in 1826. Informed sources suggest that the lion as portrayed in the seal may have some family significance rather than 'Jacobite'. There were apparently many a seal about at the time that had nothing to do with royalty and things Jacobite. As it is, the image bears little similarity to the stylized images of heraldry such as shown in the example below left. 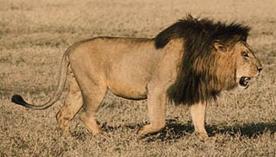 Below is a comparison of the David’s lion and photo’s of the real thing. Caption for this photo was Lion on the Savanna’ Its’ open mouth suggests growling or roaring. If someone was going to have a seal made for him or her, a lion with a forlorn countenance seems an unusual choice. But a hunting lion or prowling lion, that is quite a different matter! ‘He prowled among the lions, for he was now a strong lion. He learned to tear the prey and he devoured men’. Ezekiel 19:6. Whatever its origin the seal has become part of the David Brown legend. INDUSTRY & PERSEVERANCE – A History of David Brown (1750 – 1836), Appendix A, Relics of Interest refers. Lions as supporters. - Refer to the chapter on Supporters? 1. Miriam Chisholm Collection, NLA MS 6207, Series 3, Folder 34. Miriam Chisholm Collection, NLA MS 6207, Series 3, Folder 34.